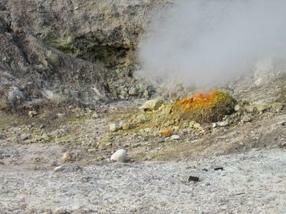 On the photo the largest fumarole (La Bocca Grande) in the Solfatara crater is shown, where the REE-dependent bacterium Methylacidiphilum fumariolicum SolV was first discovered. 14-Jun-2018: Rare earth elements (REEs) are an indispensable component of the digital technologies that are now an integral part of our everyday life. Yet their biological role has been discovered only recently. A few years ago it became apparent that these metals are essential elements for methano- and methylotrophic bacteria. One representative is the bacterium Methylacidiphilum fumariolicum SolV, which was found in a volcanic mudpot near Naples, Italy, and is known to be strictly dependent on REEs such as lanthanum and cerium for its growth. The interdisciplinary research team not only solved the crystal structure of this novel europium-containing MDH but also determined kinetic parameters in order to define the effects of various REE ions on the enzyme's activity. The results revealed that the type of REE bound in the active site has a considerable impact on MDH activity and in turn also on the growth rate of SolV.